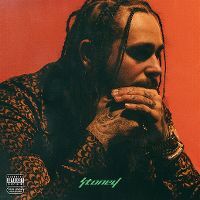 Post Malone is the highest new Hip hop artist and does show some pretty nice talents. And I guess that is what these days are like now. And this album was interesting for me. I am not a keen listener on Gangsta rap but Post's image doesn't show like that. I did enjoy Broken Whiskey Glass the main track with a Dark trap mixed in a western swing. Deja Vu was my highlight too even though I am a least fan of Justin Bieber, Leave and the closing track Feeling Whitney are the top songs mostly. Very interesting how he start off with western music or indie along sides Hip hop. And I am pleased to see if he can do the same thing on "Beerbongs & Bentley's"